One of the most frantic and exciting, yet frustrating and argument causing games out there is that of Overcooked. With the original game serving up a treat by Team17 and Ghost Town Games a few years back, and then the sequel building on everything that was good about it to ensure we were in for yet another tasty meal, if it’s a multiplayer game you are after, there is possibly nothing better. 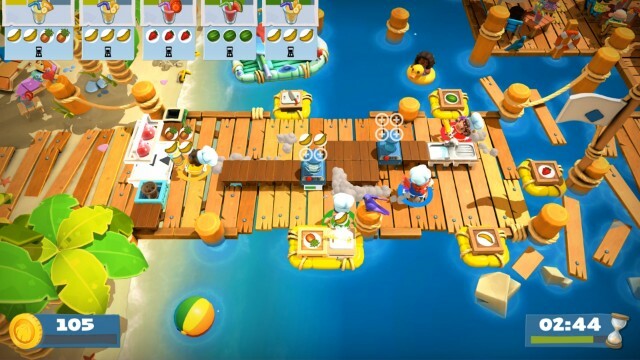 But in order to keep the flames of the local and online multiplayer scenes constantly high, Overcooked 2 needs to move with the times, and that is why we are seeing the addition of new levels, new recipes, new chefs and new ideas being brought to the madness of the kitchens. 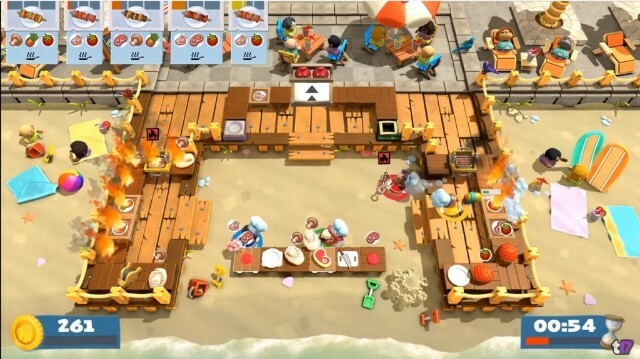 Yep, it’s time for us to progress from the base kitchens that have wowed the crowds in Overcooked 2, and move to the beach, cooking up even more of a storm with the Surf ‘n’ Turf DLC. Coming in with a stupidly low price tag for the amount of content that it brings, the Surf ‘n’ Turf DLC for Overcooked 2 most definitely does what it has set out to do. Running separately from the main campaign, and having its own little tale behind it, the opportunity to take our chef squad to the beach or cause chaos in the poolside kitchen once more is something that should not be ignored. If you enjoyed the base game, then you’ll no doubt be hugely impressed with the new campaign stages that are in place and even though the previously seen, rather clunky, map navigation system is still in place, the action found once you get down deep into each stage is once again top notch. And whilst I’m not overly bothered by a few new chef skins, the additional settings that it allows us to do this in are rather brilliant. 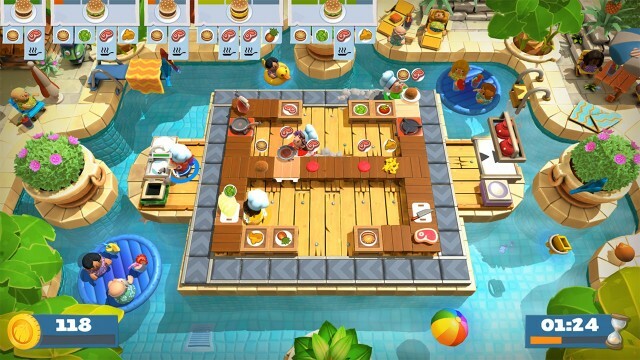 In fact, no matter whether you are putting your chefs through their paces with the creation of fruit smoothies, or found to please some diners right on the water’s edge as you attempt to do the best with the unreliable heat of a BBQ to cook some chicken kebabs, the cooking action that Overcooked 2 is now known for continues to constantly create highs. It must be said that much of what comes about this time round is the same as previous, and there aren’t really any new mechanics to worry about in terms of cooking. After all, chopping, frying, and plating up is never going to change – but with the Surf ‘n’ Turf content we do get to play around with blenders, enjoy the fun of utilising a water pistol to clean plates, and pipe a pair of bellows towards a BBQ in order to ensure the heat stays high enough to allow for proper cooking temperatures. Getting these things wrong is a constant worry. If I’m honest though it is these two latter ideas that deliver the really big changes to the whole Overcooked system. Thankfully they work very well indeed – as long as you and your fellow chefs can manage to get a decent strategy going. Of course, there are times when any strategic thoughts go right out of the window, but that is part of the draw of Overcooked 2, and it isn’t any different here. See, not only will you fall in the pool more times than you care to remember, but to really put the cat amongst the pigeons, the worry of wondering when the sea will take hold of your kitchen, washing away your progress in a flash, or moving chopping boards and specific ingredients from one place to another, is a proper task within Surf ‘n’ Turf. But it is when the elements take charge and changes happen that the real draw of this multiplayer centric title is at its best. Yes, it’s still decent enough to play alone as a solo gamer, but the shouting and screaming that comes about from a full party getting involved sees this game really shine. As you might expect, if you find yourself struggling to feed diners, or gather up stars to unlock further levels in the new, slightly tougher, campaign, then partaking in some head-to-head meal making is certainly something that will appeal – especially should you wish to hone some skills. Two new levels are in place for those wishing to take on the competition and much like that found in the campaign are delightfully created, with the usual bright and beautiful Overcooked 2 visuals complemented well with some rather funky soundtracks. It is this audio that really pushes home the fact that you are moving away from the previous lands found in the Onion Kingdom, and partaking in a bit of a beach or pool party instead. Combine the new levels, kitchens, recipes and the water pistol and bellows mechanics and you’ll find that Team17 and Ghost Town Games have once again delivered a slice of cooking heaven. If I’m being brutally honest, I can take or leave the slight visual changes the new chefs bring, but if you have a few mates that want to help you serve up some more masterpieces, then Surf ‘n’ Turf should be purchased. When you also consider that new Achievements are there for the taking, then it would be a shame for you not to even be considering the chance to get your feet wet. If you’re a fan of the original Overcooked, have a copy of Overcooked 2 to hand, and need some new content to let you really show off your cooking skills, then the Overcooked 2 Surf ‘n’ Turf DLC is something you really do need to have in your life. Not only will it float your boat – quite literally – but it’s cheap too!